Northamptonshire are 522/4 at the close of the third day of their Specsavers County Championship match against Glamorgan at Sophia Gardens. Josh Cobb and Rob Keogh resumed batting after tea on 445/3 as David Lloyd continued the bowling duties with Billy Root. In his third over of the session the latter ended Cobb’s tenure of the crease as he spliced a drive into Graham Wagg’s hands at backward point as Adam Rossington made his way to the middle with his side on 453/4. He began by outside edging Michael Hogan to the vacant ropes at third man before Keogh inside-edged the fast bowler to fine-leg en route to a 120-ball fifty. Kiran Carlson then became the ninth bowler of the innings as he replaced Root at the Cathedral Road End. 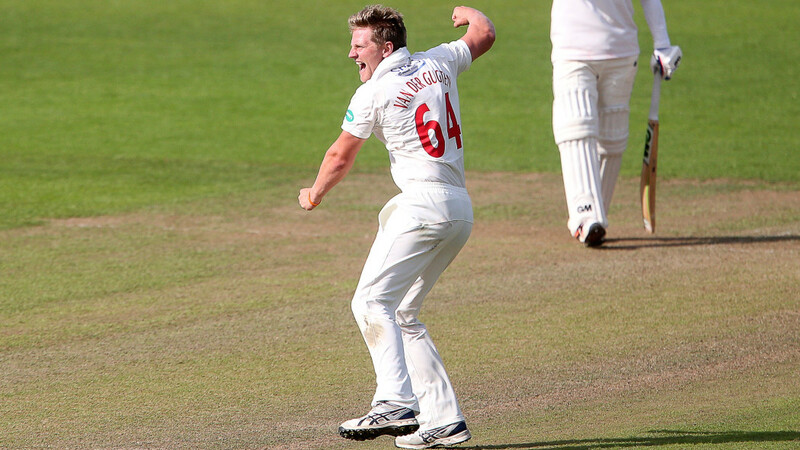 Wagg also had another trundle at the River End before Keogh lofted Carlson over long-off for six. Rossington then swept the off-spinner for four before Marnus Labuschagne had another spell, this time at the River End with Wagg in spin mode at the Cathedral Road End. Northamptonshire lost a wicket to the second ball of the afternoon as Alex Wakely edged a jubilant Graham Wagg into Chris Cooke’s gloves. 343/2 saw Josh Cobb join Ricardo Vasconcelos who was unbeaten on 181. He began by outside edging Wagg to third man but five overs later Vasconcelos, who like yesterday had become becalmed facing Marnus Labuschagne, was trapped l.b.w. as he played back to the wrist spinner. Having been joined by Rob Keogh, Cobb pulled and cover drove Labuschagne for a pair of fours before driving the leg-spinner through Hogan’s outstretched hands at mid-off. Keogh then ondrove Timm van der Gugten before edging the Dutchman through the slip cordon, whilst Cobb also lofted Billy Root over long-on for six. Keogh then drove van der Gugten through extra cover and backward point before Cobb pulled Root to mid-wicket as the follow-on was avoided. At the mid-way point in this contest, 804 runs have been amassed for the loss of 8 wickets in 192 overs and with Northamptonshire’s openers having made 234 between them on the apparently benign surface, the visitors are looking forward to more runs in the Welsh sun today as they began still 336 runs in arrears. Spinners Charlie Hemphrey and Marnus Labuschagne opened the bowling before Michael Hogan returned at the River End and delivered a series of maidens. Vasconcelos swept Labuschagne for three before surviving a run out appeal as the opening pair scampered a single. Two balls later he miscued a lofted drive and nearly holed out at mid-off He celebrated his good fortune by swatting a short ball from Labuschagne to the ropes at mid-wicket before Newton continued his sequence of singles as he approached his century. Vasconcelos reached his maiden 150 by pulling van der Gugten for four as Gkamorgan took the new ball before doing the same to Marchant de Lange as well as cheekily upper cutting him to third man. Newton then completed his century as he ended his sequence of 21 singles by clipping van der Gugten to mid-wicket. He then reverted to his singles mode as his team reached the 300-mark in the 83rd over. But three runs later van der Gugten made the breakthrough as he found the edge of Newton’s bat with Chris Cooke completing a regulation catch. Alex Wakely nearly returned to the pavilion in de Lange’s next over as he chipped a drive close to mid-on. There was nothing fortuitous about his next two strokes as he punched Timm van der Gugten off the back foot through extra cover before square-cutting de Lange to the ropes.